I realize that no one wants to hear about other people’s lists. It can be boring, for sure, but my own birding lately has been pretty much exclusively in service of my home county list, that of Guilford County, North Carolina. As I’ll mention to anyone who cares to listen (and many who don’t), county birding is particularly great for keeping motivated when other aspects of life manage to get in the way of going farther afield. My home county is mostly developed, with various parks, lakes, and fields scattered throughout. The diversity is good, though, and many of the long-time local birders have county lists north of 200 and 250 is theoretically possible. It’s my own ambition to reach 200 by the end of next year, and I’ll need about 30 birds to get there. That’s all prologue to a recent addition to the list, and one I didn’t really expect to have so easily. We all love birds, but I think we have a special fascination with birds that are difficult to find. Owls for their nocturnal habits, notably, but also rails. When I began birding, rails were particularly mysterious to me, and they are still are to a great extent. In the midwest, they were hard to find, partly because rallid diversity is lower but also because I just didn’t know where to look. Now that I live in a coastal state and rails are not particularly difficult to come by in the right place and time, that feeling that the entire family is furtive and impossible still lingers no matter how many times I find a Clapper Rail. 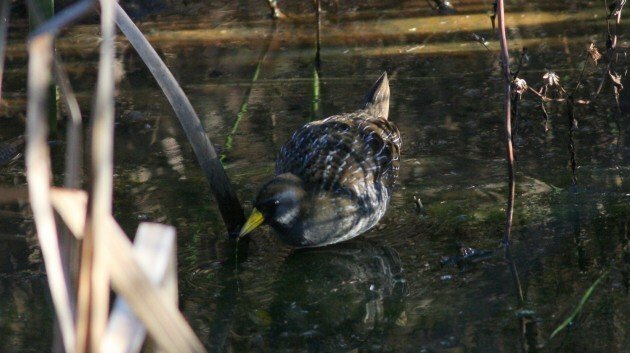 For most North American birders, Sora is the most familiar Rallid on the continent. It’s widespread, extremely vocal, and not particularly shy. I did not, however, expect to see one in a city park in Greensboro, North Carolina, however. And yet, in a secluded marsh near a public library, there it was. I walked up to the marsh to see three other birders already looking at it. It had been present, at this point, at least three days. It seemed not to care, in that particular Sora way, that there were suddenly four adults not more than 20 feet from it, until a particularly loud cell phone ringer caused it to slowly strut back into the cattails out of view. It’s hard to get over your initial impression of a bird or family. Rails are impossible because that’s how I thought of them when I was a kid birder. The same way that I have a hard time letting go of the fact that Eastern Towhees are furtive skulkers and Gray Catbirds denizens of tangled vines no matter how many of them I see hopping around on my lawn. Our first impressions are often the ones that stick with us regardless of the poor application of them to new places. There’s probably something in there about exposure to new ideas being important for our growth as people more generally, but as I’m a birder and everything has to pass through that filter, I’m not prepared to make it. In any case, Sora means one fewer difficult bird for my county list on it’s way to 200. Or at least it feels that way. May I complete the fascinating trinity by adding cuckoos to owls and rails. Any one of which brings a sparkle to the day. A Sora though would shine through by virtue of being a lifer for my list. 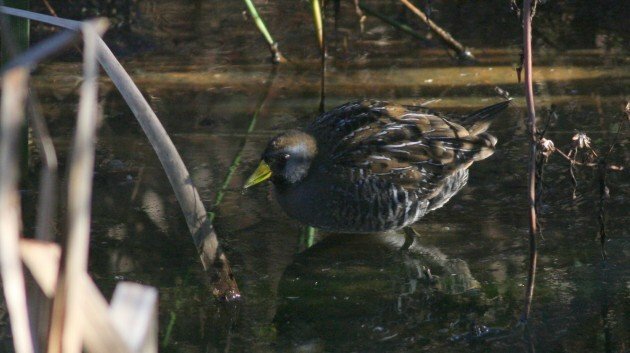 If a Sora ever makes it to Hawaii, this post’s title will get a lot of Google love!